Who says you can’t enjoy spaghetti, this traditional and beloved comfort food, on Paleo? In fact, the sauce can be perfectly Paleo and there’s no better way to substitute regular wheat pasta with spaghetti squash. The resulting taste and texture is just as satisfying while not compromising your health. 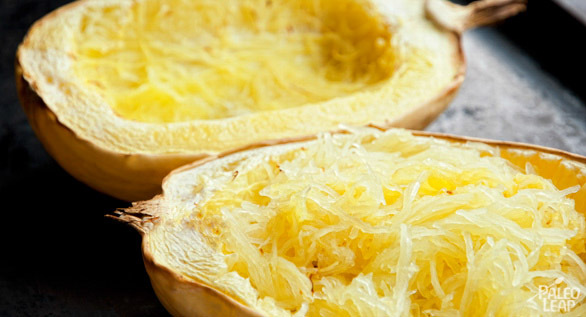 Spaghetti squash is a good source of beta-carotene, potassium and folic acid. The sauce presented here is a Bolognese sauce that’s hearty and thick. It’s not a runny sauce and is has a lot of meat and vegetables. For this reason, it’s better to use plum tomatoes that are very meaty. If you don’t have your own garden tomatoes, you can go with the Italian canned tomatoes. The San Marzano tomatoes are a controlled kind of tomatoes. True San Marzano tomatoes can only come from San Marzano in Italy and are very meaty and tasty. The price point for these tomatoes is higher, but the resulting sauce will be much better. The recipe for the sauce is for about 8 servings, just so you can at least have some leftover. I encourage you to do a big batch and to freeze what’s left for a later use. Use about 2 medium to large spaghetti squashes for 4 people. Heat a large Dutch oven or pot and add cooking fat. You can use less fat if your ground beef is fatty, but it’s really a question of taste. Cook the ground beef and bacon for about 5 minutes. Remove the meat with a slotted spoon and set aside. Use the same Dutch oven or pot to cook the other ingredients (carrots, celery, onion, garlic and oregano). Cook the vegetables until soft at medium heat. Add the tomatoes, tomato paste, ground beef, bacon and bay leaf. You can break the tomatoes a bit, but the cooking process will break them anyway. Optional: season with salt and pepper. You can also add some chili or hot pepper flakes for more heat. Bring to a boil and then reduce to a simmer for about 45 minutes. In the mean time, heat your oven to 350 F.
Cut your spaghetti squashes in half length-wise, remove and discard the seeds. Put the halves cut side down on a baking sheet and put in the oven for about 28 to 35 minutes. Check them for doneness with a fork at around 25 minutes. Make sure not to overcook them because they will become mushy and won’t make pastas. 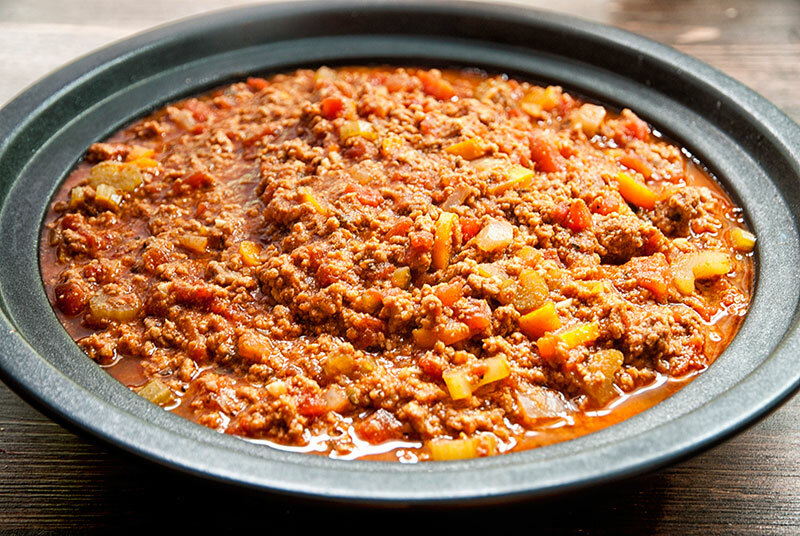 Once your Bolognese sauce is cooked, you can add about 1/2-1 cup of heavy cream. This will make the sauce less acidic. You can now pour a generous amount of the sauce directly on the squash halves so that they form their own bowl or you can scrape the inside out with a fork to form spaghetti-like pastas and serve on a plate with the sauce. As a final touch, when you put the sauce directly on the squash half, you can add some grated pastured and grass-fed cheese on top and broil in the oven for about 5 minutes. This is completely optional and only do this if you consume cheese.